Welcome to the Clearwater Valley Railway Co. This website is intended to document my foray in On30. This is a new scale for me, as up until now my main modeling scale has been “N” scale with some dabbling in “HO” scale. I have always had an interest in narrow gauge and logging. Thanks to Bachmann and their very affordable and great looking On30 locomotives and rolling stock, I couldn’t resist the temptation any longer. This layout is intended to combine my interests of logging and narrow gauge. The reason for the change in scale was brought about due to my lack of satisfaction with the design of the latest version of the OA&PS Ry. The OA&PS Ry shared the same space as the furnace, hot water tank and electrical panel. I was planning to build a multi-deck layout, but I was never really happy with the design due to the obstructions in the present space and the clearances and access they required. But enough of the OA&PS Ry, it’s now time to introduce the Clearwater Valley Railway and the Okanagan Lumber Company. 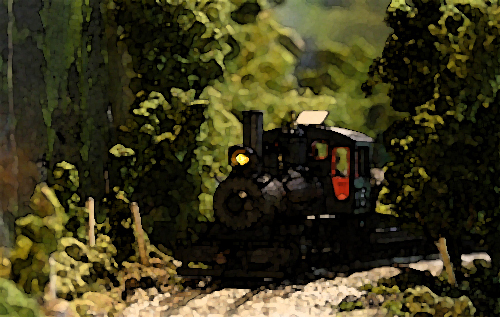 The Clearwater Valley Railway is a freelanced railway located in British Columbia, set in the late 1920’s and is a figment of my fertile imagination. The location of the railway was derived from a very scientific process. I decided to model an area completely different from my previous efforts that were located in Southern Ontario. A struggling backwoods operation has always appealed to me so a map of British Columbia was attached to a dartboard and a dart thrown, and the winner was….. Clearwater, well the closest town to the dart was Clearwater. Now a railway has to go somewhere but before we go there, let’s see what my wants are for this model railway. I really like operation, so the layout will have to support operations. There has to be a yard of some sort to store (and show off) equipment and continuous running so I can break in new equipment and sometimes I just like to watch the trains run. Now that I had a location I needed to figure out a route for the line. I wanted a north and south route as there were already 2 other much larger railways crossing the mountain ranges so adding a third one didn’t seem plausible. By going north and south the railway would run between the mountain ranges and connect to an existing east-west line. It was time to look at the map again (the dartboard wasn’t required this time) and look for a plausible route for the railway. After looking at the map I quickly found that the distances between towns going East-West was too great so a Southeast-Northwest route was chosen. With the space I had available for the layout I decided that Clearwater would be centered in the middle of the line with a connection there to a standard gauge railway. I later decided that for operational reasons it would be better to have the connection with the outside world (the standard gauge connection) at one end of the modeled portion of the line. Mara was chosen as the southern terminal of the railway. The route between Mara and Clearwater would pass the tip of Adams Lake making it a plausible place to put a log dump. The northern terminal of the railway is a place called Lac La Hache. These towns were chosen more because I liked the names more than anything else. Looking at topographical maps these two towns are way too small to support a railroad, but in my world, because the railway went there, the towns grew. The modeled portion of the layout starts at Mara in the south and ends at Mosquito Flats where it interchanges with the standard gauge Canada Northern Railway. There is a provision for continuous running that will be used for testing and breaking in locomotives and rolling stock. This entails a lift-out section that goes at the entrance of the room and will not be used during operating sessions. The locals call this section of the line “the loop” and is shown as such on the system map. As to a name for the railway, seeing as the railway is located in the Thompson / Okanagan Valley, the name of the railway became the Clearwater Valley Railway Co., besides, it sounded better than River, Creek, Northern or Southern (at least to me) and it sounds back woodsy enough to me, which is what I am looking for. Main motive power in the railway will be 2-6-0s, 4-4-0s, the odd Forney and other locomotives of similar size. There is a porter on the property that was used for the construction of the line and is still in use for maintenance of the line. There are also some rail trucks on the property for the use of railroad officials and as the need arises. Freight equipment will be standard issue modified to suit with some home built equipment thrown in the mix. Passenger equipment will be home grown. This covered the back woods railway portion of the layout, so now it’s on to the logging portion of the layout. With a railway in the area, the Okanagan Lumber Company expanded its logging operation and built a line from the Clearwater Valley Railway up into its property for the purpose of hauling logs out of the woods. Logs are brought out of the woods and travel on the Clearwater Valley to their log dump on Adams Lake. From there, the logs are floated on the lake to the company’s sawmill. Motive power for the lumber company consists of the typical geared locomotives that logging company’s typically used, mainly shays and climaxs. Rolling stock consists of log disconnects, flatcars and maintenance equipment. Well that’s the layout in a nutshell, feel free to look around and if you have any comments I’d be glad to hear them.